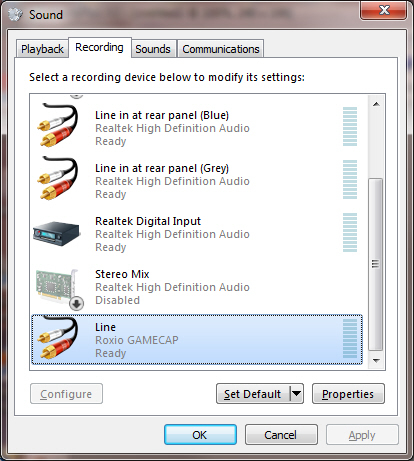 Unfortunately, the Roxio Game Capture recording software doesn't bring out the recording level controls, those are left to be accessed inside the Windows volume controls. Start by right-clicking on the volume control and selecting "Recording Devices." 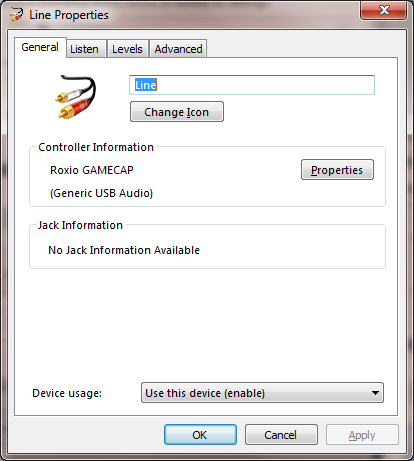 Now double click on the Roxio Game Cap device to bring up the following window. Then click on the "Level" tab at the top and adjust the volume down so it's not distorting. Yeah, it became clear month ago that these clowns couldn't give a two monkey's whether or not their products work properly. Have you seen this article? 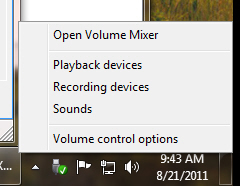 If you have Skype installed, apparently it may do funky things with your volume settings. 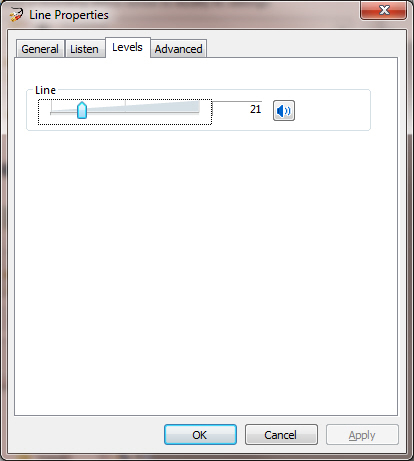 So open Skype and try setting the volume down there. Interests:Video-Games, Rec video-games with my Roxio Video-Capture for consoles, Movies and alot other-things. And did you follow the link to the article? Do you have Skype installed? I did follow the article advice but no luck. It is still the same and as well I un-install Skype on my lap-top. to the audio OUT of my Roxio and put the cable into the Mic-IN of my Notebook. So I opened the windows Audio mixer and lowered the gain-In for this "microphone"
For capturing I usually use virtual Dub and there you can pick your source for the audio to capture. Just select the new Mic and you will have a brilliant sound from your RBC without many efforts. I hope this short guide will help you to solve some sound-issues. Thanks for the info m-atze. But this is my last attempt to get this thing to work without having to reinstall it to fix the audio problem. Thank you very much, m-atze, it works like a charm now, no distorted audio anymore. It's only taken since july for someone to sort this major issue and you come along and in two posts you solved the issue! ya i cant figure out what that saids. you don´t have to record the sound via USB from the GameCapture, where you can´t change the level of sound etc. I was able to change the levels of sound so that I can reduce the distortion. I have mine all the way down to zero and there is still distortion. Any possible fix? I just want to expand on this solution for those having trouble if I may. I managed to sort the distortion (at least in my mind I have) after trying a lot of stuff. In the end it was very simple. As the OP said, open up your roxio game capture line (make sure you are listening to the device) and reduce the line volume very low (I set it to 0 and it worked wonders). Some users report that the sound eventually goes back up, this is true. I noticed when I started the game (or when I start my livestream) the line volume jumps back to 100. As far as I know it does this a lot more frequently if you close off the line volume window. What I did was keep the line volume Window open, set it to 0. Started the game, it jumped to 100, set it back to 0 and leave the window open for the duration of the recording. It stayed 0. After this I recorded a battle on final fantasy XIII-2 (these battles normally have VERY high distortion if you didnt do the above) and there was no distortion for the whole battle and everything was very smooth and easy on the ears. Can somebody please help me? This is not working at all. When I go on Recording devices and turn the slider to 0, the sound still distorts. (And yes, I make sure that it stays at 0.) I also go on 'Volume mixer' and turn the slider for Line Roxio game cap down too. The sound STILL distorts. For extra information, my settings for visual/audio settings are set correctly and I use turtle beach for my mic. Somebody please reply or send me a personal message to give me a step by step guide. This is very frustrating, as you can imagine.